The selfie initiative was created in 2014 to provide breastfeeding women who could not attend a Big Latch On event in person a chance to participate online and encourage them to connect with other breastfeeding mums via social media sites such as Facebook. 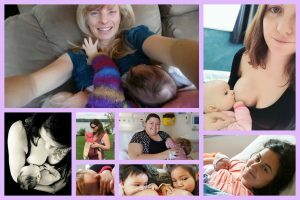 Recent New Zealand based research has shown that breastfeeding women who are connected to online communities report feeling more confident and supported. 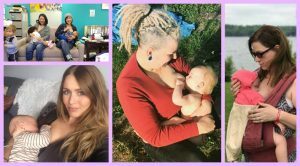 Through sharing their breastfeeding selfies on Facebook, women are able to connect not only with others taking part in the Big Latch On, but also to identify breastfeeding supporters within their own networks. The introduction of online participation in the Big Latch On is designed to coexist with the physical participation, rather than replacing it, as a way of creating more ways for women to feel supported and connected while breastfeeding. 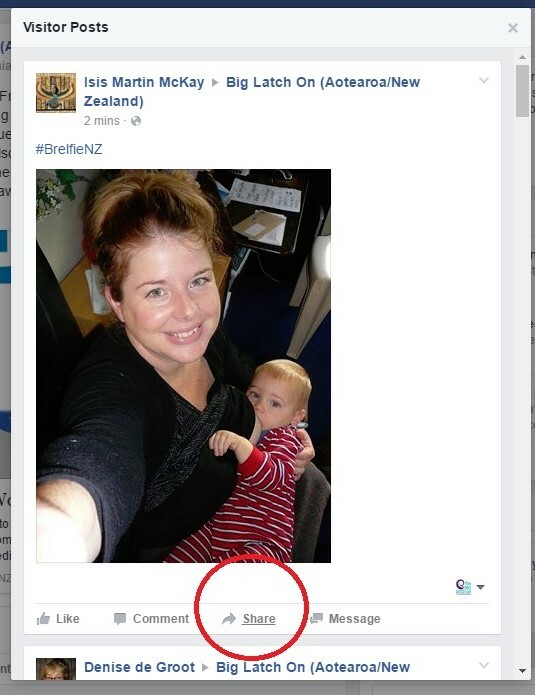 The selfie campaign involves women taking a photo of themselves breastfeeding and sharing it on social media with the hashtag #BrelfieNZ. Selfies can be uploaded to Facebook, Twitter or Instagram. Selfies can be uploaded to Facebook, Twitter and Instagram. If uploading to Facebook, the selfie can either be shared on your own Facebook page, or to the Big Latch On Facebook page (or both). 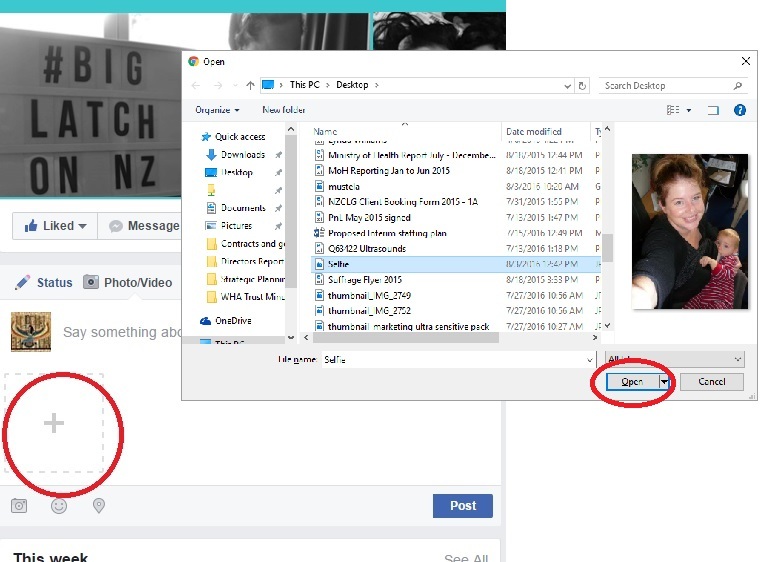 Instructions for how to upload your selfie to the Big Latch On Facebook page from your computer are below. Make sure you write the words ‘#BrelfieNZ’ in the caption for your picture to connect it to the ‘I Latched On’ selfie campaign. 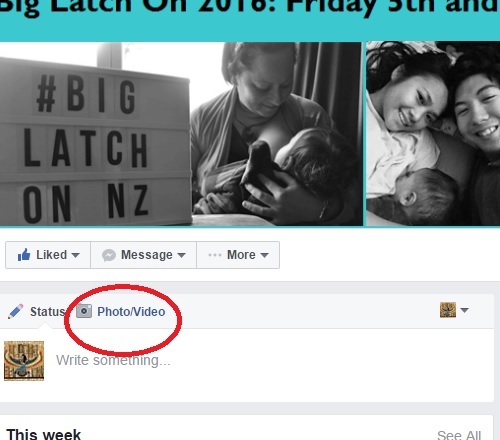 PLEASE NOTE: The Big Latch On NZ Facebook page is a PUBLIC PAGE and Women’s Health Action cannot be responsible for the privacy of photos uploaded onto our page. 2. Click the square with a plus sign (+) inside it. This will let you select the picture you would like to upload. Select the picture and click open. 3. Caption your picture. You can put anything you like as the caption, you might like to let everyone know your name, and the name and age of your breastfeeding child. Don’t forget to type the hashtag #BrelfieNZ to connect your picture to the other selfies in the campaign. 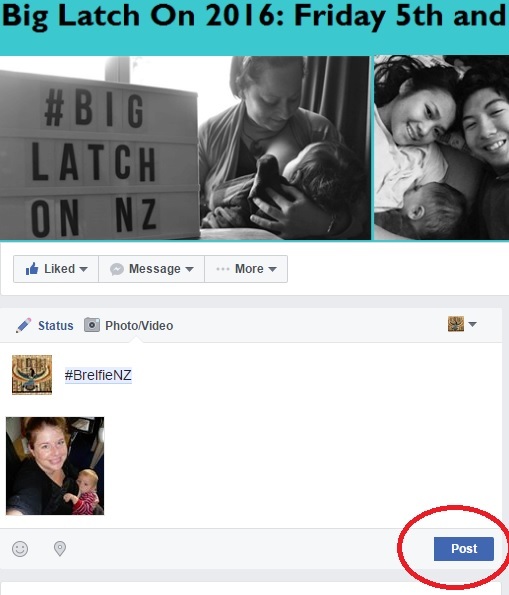 Click ‘post’ to upload your picture to the Big Latch On Facebook. 4. Your picture is now uploaded. You can click ‘Share’ to share your photo on your own Facebook page to connect with more people in your own network. Have more questions?? Click here for Selfie Frequently Asked Questions.